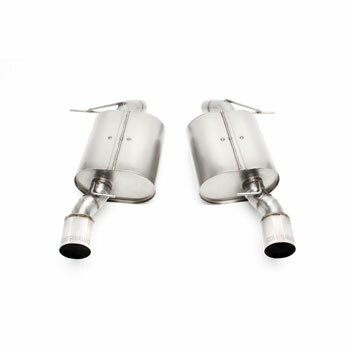 Dinan's free flow exhaust for the 335i Sedan improves exhaust flow increasing power output and a great sporty sound, civilized when you want and aggressive under harder acceleration. Special Note: For Standard bumper only. Not for M-Tech bumper. Dinan's free flow exhaust for the 335 Sedan improves exhaust flow by reducing back pressure, resulting in increased power output and a great sporty sound that is civilized when you want it to be and pleasantly aggressive under harder acceleration. 100% stainless steel construction and exacting specifications ensure that the system fits correctly using the factory hangers and will resist corrosion for years to come. The design reduces overall weight as well and features 3.5'' polished stainless tips for a tasteful high performance look.